Republican mural in Sráid na Sceithe/Hawthorn Street at the junction with Cavensish Street celebrating the lives of Winifred Carney and Nora Connolly. 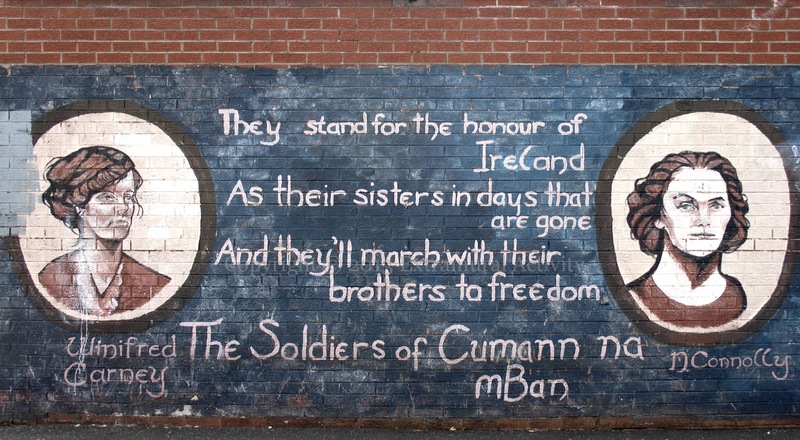 “They stand for the honour of Ireland, As their sisters in days that are gone, And they’ll march with their brothers to freedom, The soldiers of Cumman na mBan.” Below is a 1965 video of Connolly talking about her life (1893-1981 (WP)) and her father James Connolly, who was executed after the 1916 rising. Carney, who grew up and lived in Belfast, was inside the GPO with Connolly. After the rising, she returned to Belfast, married a Protestant, and continued to advocate socialism (WP).